Needle embedding involves permanently implanting tens, hundreds, or thousands of metal fragments. In 1976, the Japanese Acupuncture and Moxibustion Association tried stopping their members from practicing it, though “[S]ome practitioners do not abide by the recommendation and are ignorant of the results of malpractice.” Simultaneously, veterinary acupuncturists in North America adopted the technique and renamed it “gold bead therapy”. In addition to needle fragments, veterinarians embed stainless steel “beads” and gold-plated magnets, often unsterile. More plausibly, if the treatment has any effect, it likely arises from the implantation process itself, wherein fragment clusters drive through large bore spinal needles, constituting heavy duty acupuncture. Systematic studies fail to support gold bead therapy. Two double-blind evaluations in dogs with hip dysplasia showed no significant benefits. Recently, a methodologically flawed study heralded by gold bead proponents as “proof” of its value compared needle implantation at “real” acupuncture points to no implants at “non-acupuncture” points, making it impossible to determine whether the gold beads made any difference. 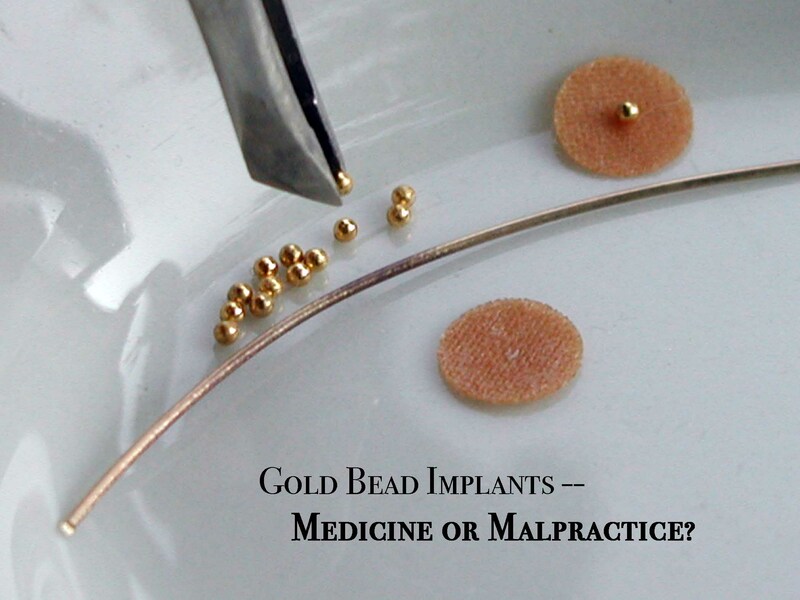 Gold bead therapy offers no proven benefit over regular acupuncture and poses substantial potential for injury. The fact that implantation is regarded as malpractice in human medicine should come as a wake-up call to the veterinary profession. Peuker ET, White A, Ernst E, et al. Taumatic complications of acupuncture. Arch Fam Med. 1999;8:553-558. MacPherson H. Fatal and adverse events from acupuncture: allegation, evidence, and the implications. Journal of Alternative and Complementary Medicine. 1999;5(1):47-56. Lectures on implants and gold bead therapy listed for the 2008 AAVA Annual Meeting – Nashville, Tennessee, March 7-9, 2008, obtained at http://www.aava.org/php/aava_blog/?p=40 on July 29, 2007. Gerard PS. Images in Clinical Medicine: acupuncture-like fragments. NEJM. 1995;332(26):1792-1794. Imray TJ and Hiramatsu Y. Radiographic manifestations of Japanese acupuncture. Radiology. 1975;115:625-626. Durkes T. Gold bead implantation in small animals. The Medical Acupuncture Web Page. From the International Veterinary Acupuncture Society (IVAS) 25th Annual Congress. Obtained at http://users.med.auth.gr/~karanik/english/articles/durkgold.html on July 29, 2007. Durkes TE. Gold bead implants. Problems in Veterinary Medicine. 1992; 4(1):207-211. Eagle K. Acupuncture-needle fragments. New England Journal of Medicine. 1995; 332(5):304. Durkes TE. Chapter 25, Gold Bead Implants. In Schoen AM (ed. ): Veterinary Acupuncture – Ancient Art to Modern Medicine. St. Louis: Mosby, Inc. 2001, pp. 303-305. Hielm-Bjorkman A et al. Double-blind evaluation of implants of gold wire at acupuncture points in the dog as a treatment for osteoarthritis induced by hip dysplasia. The Veterinary Record. 2001; 149:452-456. Bolliger C et al. Gait analysis of dogs with hip dysplasia treated with gold bead implantation acupuncture. Vet Comp Orthop Traumatol. 2002; 15:116-122. Jaeger GT, Larsen S, Soli N, et al. Double-blind, placebo-controlled trial of the pai-relieving effects of the implantation of gold beads into dogs with hip dysplasia. Veterinary Record. 2006;158:722-726. Galuten A and Austin JHM. Permanent subcutaneous acupuncture needles: radiographic manifestations. J Can Radiol Assoc. 1988;39:54-56. Gerard PS, Wilck E, and Schiano T. Imaging implications in the evaluation of permanent needle acupuncture. Clinical Imaging. 1993;17:36-40. Von Riedenauer WB, Baker MK, and Brewer RJ. Video-assisted thorascopic removal of migratory acupuncture needle causing pneumothorax. Chest. 2007;131:899-901. Yokogushi K. Embedded needles in acupuncture: case report and review of the literature. Medical Acupuncture. 15(3). Obtained at http://www.medicalacupuncture.org/aama_marf/journal/vol15_3/case4.html on July 29, 2007. Peuker ET et al. Traumatic complications of acupuncture. Arch Fam Med. 1999;8:553-558. Yamashita H et al. Systematic review of adverse events following acupuncture: the Japanese literature. Complement Ther Med. 2001; 9(2):98-104. Anonymous. Confirmed or suspected adverse effects of acupuncture. Obtained at http://websites.golden-orb.com/pain-education/100194.php on 030303. Vassiou K, Kelekis NL, and Fezoulidis IV. Multiple retained acupuncture needle fragments. Eur Radiol. 2003;13:1188-1189. Hasegawa O, Shibuya K, Suzuki Y, et al. [Acupuncture needles, straying in the central nervous system and presenting neurological signs and symptoms.] Rinsho Shinkeigaku. 1990;30(10):1109-1113. Abumi K, Anbo H, and Kaneda K. Migration of an acupuncture needle into the medulla oblongata. Eur Spine J. 1996;5(2):137-139. Kim YJ, Kim JY, Choi BW, et al. Images in cardiovascular medicine. Right ventricular acupuncture needle embolism detected on coronary computer tomography angiography. Circulation. 2006;114(23):e623-e626. Adeniran A, Hobby JAE, and Bentley B. Removal of minute foreign bodies. Journal of Accident and Emergency Medicine. 1995;12:298-299. Kakurai M, Demitsu T, Umemoto N, et al. Activation of mast cells by silver particles in a patient with localized argyria due to implantation of acupuncture needles. British Journal of Dermatology. 2003;148:822. Romaguera C and Grimalt F. Contact dermatitis from a permanent acupuncture needle. Contact Dermatitis. 1981;7(3):156-157.